Original Wallpaper: Happy Birthday, Princess! Minitokyo »	Original Wallpapers » Original Wallpaper: Happy Birthday, Princess! awww this is a wonderful present =]. there's like one petal that looks kind of awkward, and i wish you patterned the skirt differently. lol she looks exactly like your avi so great job ^^. The background is magnificent. Those trees are so.... awesome! You really are talented at painting backgrounds! LOOOL, I love Kitten's expression! HAaa! is acute cute looks a very good Friends! 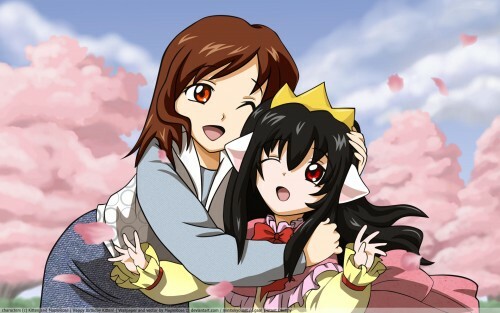 I almost died from the cuteness when I first saw this :P You made chibi Kitten-hime way too adorable. And you look cute too. The clothes are nicely done and the painted background is so so pretty. What an awesome gift! Well done on the shading~ I like the textures on her clothes! So cute and lovely. Great Job.